Earn $12.89 in Rewards credit (1289 points) What's This? An alternative to ordinary cantilever brakes, the extraordinary Paul MiniMoto is a mini v-brake designed for use with standard short pull brake levers (like those found on most road bikes equipped with drop bars). It's simpler to install and simpler to adjust, with a narrow profile that's still got plenty of space for tire, fender, and mud clearance. Quick release to make changing wheels and fixing flats no problem. 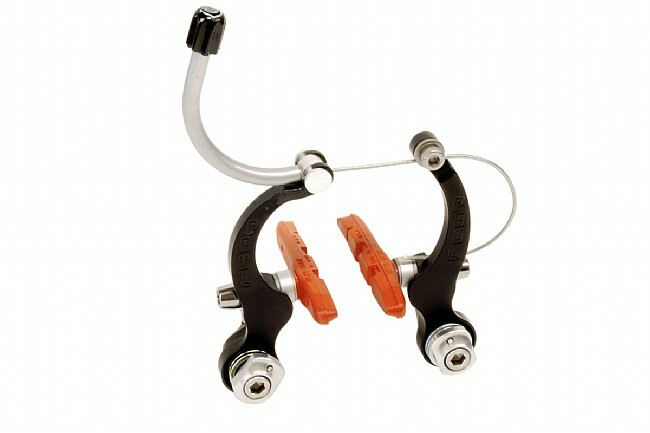 Comes with rim-friendly KoolStop Thinline wet/salmon compound brake pads. CNC'd of 6061 aluminum for lightweight durability. Black or Silver. 108 grams per wheel. Made in the USA. Note: 1 quantity is 1 brake caliper set (enough for one wheel). Buy 2 quantity to outfit a complete bike front and rear. Easy to install. Helped me a lot. Very good to convert your bike from cantilever to v-brake. I doubt there is a better brake. I used these brakes to upgrade the brakes on my cx bike. Easy to install and they just work well. Excellent stopping power and modulation. I especially like the ease of disconnecting the cable for easy wheel changes and the spring tensioner on the brake arms. Replaced the stock canti front brake on my commuter after tiring of poor wet braking performance. The MiniMoto is super easy to set up, and is a HUGE improvement. A bit pricey, but worth it. I jsut installed a pair of the MiniMotos on my Santana road tandem and they are a fantastic upgrade over the standard equipped Avid Linear V Brakes. Incrediblty easy to install and adjust. In addition, they look aswome.